Garmin is trying to get a vacant spot, ideally at the CTK or Cool Kids Table, in the pantheon of wearable fitness tracker that’s ever expanding. It’s been known to produce many of the best GPS sports watches and so there were high expectations for the company’s first tracker which added one or two nice tricks but had too many holes. It’s the Garmin Vivofit. Like the Nike Fuelband, the Fitbit Force, or the Jawbone Up, the Garmin Vivofit is an activity tracker that’s like a band worn on the wrist. It tracks sleep, monitors active time and counts steps. It’s of importance because Garmin has so many loyalists and so you are able to track each of your athletic pursuits from one page (if you use other watches by the company) the vivofit integrates into the company’s online platform that already exists. It’s among the first to pair with an ANT+ HRM. This is sold separately and the pair is meant to give you an idea of what happens while you workout. You also don’t ever need to charge it or worry about charging it, and that matter too. The device is a small pod that can click in and out of the wristband, should you want to change colors (it also comes with a small and a large band for different wrist sizes). It’s a pretty sleek wristband with an always-on, reflective LCD screen that’s especially helpful when you’re running and need to take a quick peek at your heart rate. You toggle through the different display screens with the only button, which is next to the up top. It’s a low profile, easy-to-adjust bad that basically stays out of the way. It has a pair of posts popping through some holes to ensure it’s kept in place. The device possesses an ANT+ radio that can be paired with a chest-strapped HRM as you work out. Also incorporated in it is a Bluetooth 4.0 radio with which data is sent to your mobile device. And in case you don’t have a Bluetooth 4.0 supported phone, with the ANT+ USB dongle that comes with it, you can sync through your computer directly. Tagged as the first tracker you never really have to take off, swimming and showering just got more interesting because the Garmin Vivofit is waterproof for up to 50 meters. It uses a non rechargeable, replaceable battery that lasts over a year, according to claims by Garmin. The Garmin Vivofit is a really comfortable tracker for starters. It has a very nice look while being quite discreet, though, I got worried when I noticed the clasp’s directly on my inner wrist, but then it didn’t apply too much pressure because it’s quite thin. 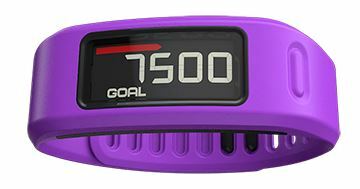 The Vivofit sets your goals in little increments so it doesn’t overwhelm you. If in the previous day, you did not walk enough, the goal of the current day will be quite lower and will be quite higher if you nailed it. And if you had been sitting down for the last hour, it will show a red bar on the screen which covers about half the screen. For every extra 15 minutes of inactivity, extra portions light up and if you don’t do anything about it and allow the bar go the entire length, you’ll get severe chemical burns because the band will explode on your hand. Just kidding! The only thing that happens is that the band will stare at you for your indolence until you walk the red bar off. Not fascinating right? The device works beautifully well when paired with an iPhone and the dongle/desktop software method also worked well. But be sure to check out which devices it is compatible. Well, to initiate the sync with the device, you’d have to hold down the button. This is something other devices do automatically at regular intervals, making them more convenient. But syncing with Garmin’s HRM chest-strap only takes a few seconds. It’s syncing with phones that’s a little more problematic. Recently, Garmin Connect website was revamped and now looks a whole lot better. It’s more intuitive and flows better. But a few things still need fixing. For example, pages that appear as plain .txt documents and windows with incomplete information, mobile apps that definitely need a lot more work. 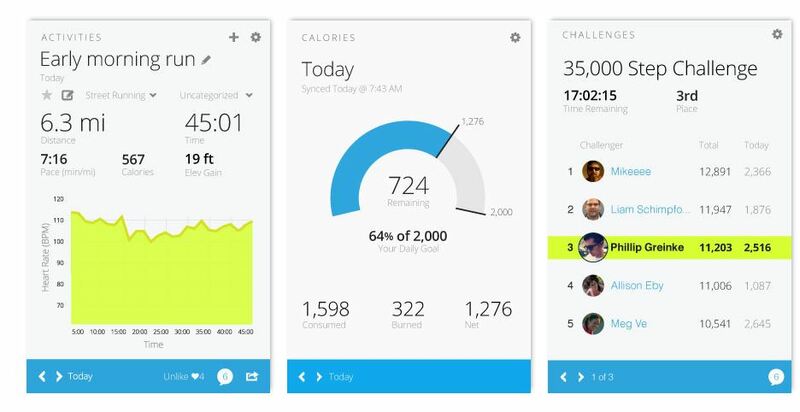 So, besides the Vivofit not compatible with many Android devices, ‘outdated’ is how the apps look. I like the fact that it is waterproof and have not need to think or worry about charging it. I also appreciate the always-on screen because it comes in handy while running. It’s an added bonus if you talk about pairing with an HRM. The screen doesn’t have any light. That’s the biggest flaw of all. So in low light areas, it’s quite difficult to see. To put the device in sleep mode, you’re meant to hold down the button for 5 seconds. Hold it for only 3 seconds and sync mode is what you get instead. And if you add two extra seconds to the five seconds mistakenly, you’ll be in pair mode. And if you’re doing all of this in the night, since it also doesn’t vibrate or beep, you don’t have any feedback to tell you the mode you are in. Also, the “Move bar” is pointless because it does not beep or vibrate. It can only be of any good to you if you remember to look at it. It would have been 20x more useful at motivating you to move if only it could vibrate. It would also have been able to function as a silent alarm (just like the Fitbit force). It’s disappointing that it does not sync with most android phones. And since you have to hold down the button to manually sync, you’re at a loss on your phone being able to give you more insight than can be gotten by the band alone in real time. It’s a hard pass at $130 alone or $170 with the HRM, though it possesses some good ideas but they’re not integrated properly. As for the HRM, since you’ll only be having it on for workout, which it is also bad at tracking, it doesn’t make a lot of sense. There are also a number of stats that aren’t there e.g. elevations, maps etc. A GPS watch is way better than it. It’s great you don’t have to charge it though, but a lot of those competing with it get battery life of over one week, meaning you don’t charge them so often. On the whole, for what it can do, it’s way too costly. GGPS watches like the TomTom Run or the Garmin FR 220 are a lot better. The same goes for the Fitbit One and the Withings Pulse which are dedicated activity trackers, and even the Epson’s Pulsense Band. This entry was posted in Garmin GPS Running Watch and tagged Garmin, Garmin Vivofit, Garmin Vivofit Fitness Band Review.